It is a busy day in the client SSD space as earlier today AMD announced the company's first SSD, the R7, and now SanDisk is releasing the Ultra II to the mainstream market. The Ultra II is based on SanDisk's second generation 19nm TLC NAND, which means that the Ultra II is the first non-Samsung SSD to ship with TLC NAND. We have covered TLC NAND several times already, but in short TLC NAND provides lower cost at the cost of performance and endurance, making it a feasible option for value drives. Similar to SanDisk's other client drives, the Ultra II is based on the Marvell 88SS9187 platform. SanDisk's expertise lies in the firmware development and NAND know-how, which has generally given them an advantage over other Marvell based solutions. Unfortunately I do not have the full spec sheet yet, so I have to go by the limited details listed in the press release, but I will be updating the table with more specs as soon as I get them. Update: Full specs added. 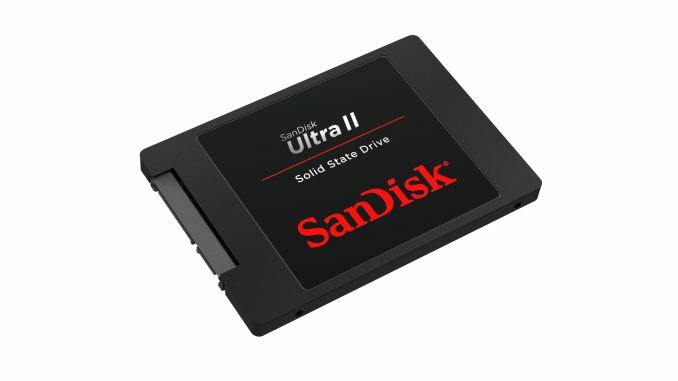 The Ultra II utilizes SanDisk's nCache 2.0 technology, which operates a portion of the NAND in SLC mode to increase performance and improve reliability. As a result, the Ultra II is able to achieve write speeds of up to 500MB/s even at the lowest capacity, although it should be kept in mind that this is peak performance -- as soon as the SLC buffer is full write speeds will drop quite dramatically. SanDisk is also bringing a new version of its SSD Dashboard along with the Ultra II. The new version features support for 17 difference languages and includes "Live Chat" in case the user has any questions about the Dashboard or SSD. Additionally, SanDisk is including cloning and antivirus features via third party software (Apricorn's EZ GIG IV for cloning, Trend Micro Titanium Antivirus+ for malware) with the goal of helping users to transition from a hard drive to an SSD. Combining antivirus with the SSD Dashboard might seem a bit odd but it actually makes sense. When you are about to clone your Windows install to a new SSD, the first thing you should do is a run an antivirus scan to make sure that no malware will be transferred through cloning because malware can ruin the faster user experience that an SSD provides. Samsung certainly set the bar high with the SSD 840 and 840 EVO, so it will be interesting to see how SanDisk can match that. Pricing is very competitive with the 840 EVO and Crucial MX100, so as long as SanDisk has been able master the firmware for TLC the Ultra II should a viable option for value oriented consumers. The Ultra II will be available next month and we are scheduled to get review samples within the next couple of weeks, so stay tuned for the full review! Wow, they actually made the TLC good enugh for SSD use. I remember you reported a while back, that 2nd gen TLC isn't quite ready for SSD use (Only few 100 p/e). Guess that changed. To be honest the average Joe/Corporate user who is used to running daily off an old 250GB rust spinner pushing 60MBps would be thrilled with a SSD running at just 250MBps Read/Write and 0.1MS access times. Well, for a 70$ mark we'll have to wait a bit for the process to mature, so it costs less to make. Or for 3D nand to become a thing for mainstream drives aswell.